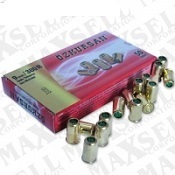 Image Below Or Add To Cart Package of 50 9MM/380 Blanks. These will fit our 9MM/380 Blank firing 1873 Peacemakers and all of our 9MM/380 REVOLVERS ONLY. With Blank Guns 9MM Blanks and 380 Blanks are actually one and the same. These 380/9MM Blanks are about as Loud as a Real Live Fire Handgun. Your Blank gun will have the correct type blanks needed written on it. If it calls for 380, 9MM or 9MM RK this is the correct blanks. The Image and brand of blanks shown here may vary but they will always be the correct, reliable high quality blanks.